007 is on the trail of Patrice, and follows him up a Shanghai office block, where we are greeted by some stunning visual cinematography; neon lights, colours and images bounce around the screen, and all to set up an assassination scene. Patrice has clearly been to the Burglars ‘R’ Us store because not only does he have a handy case sized glass cutter. Not only does he have a handy case sized glass cutter, but it’s electric. Not only does he have a handy case sized electric glass cutter, but it is rechargeable – no power required. A brilliant gadget, and industrial strength too – the glass he bores a hole in is around an inch thick. It’s even better than the one 007 used in Diamonds Are Forever. If you are thinking of taking up burglary, it would be understandable if you didn’t want to invest in high tech machinery like this, especially with the costs of swag bags, masks and gloves to be considered. You will need to start somewhere though, and when scaling tower blocks – a bit like Catherine Zeta Jones in Entrapment, you may be able to stretch to a simpler device such as this MDI Circle Cutter. The Shanghai scenes featured a cracking Dr No reference sub-plot. Severine unveils a painting to an unexpecting assassination victim. 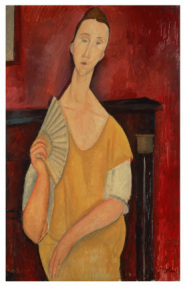 It's Modigliani's Woman with a Fan painted in 1919. It was stolen from the Museum of Modern Art in Paris, on May 19th 2010. It has been rumoured that it ended up in China. The whole scene, from the drive through the blue neon lit streets of Shanghai, to the neon lit tower block fight, to the homage to previous films, was quite brilliant stuff for James Bond fans.